Photo highlights: Photos © Steve Bird. Click to see a larger version. After meeting Pricilla and Alice at the hotel, we travelled to JFK airport to pick up the rest of the group from Birdseekers. The day was bright and sunny for a winter day. The flight from Heathrow was on time and Billie, Frank, and Peter joined us all remarking on the glorious day and warm temperatures. We drove a short distance to Jamaica Bay National Wildlife Refuge and it was warm enough for an unexpected picnic lunch al fresco. Double-crested Cormorants flew over as did a beautiful pair of Snow Geese showing their striking white and black coloration. A Northern Mockingbird was spotted as we began our walk to the West Pond. At our first stop along the trail, a large group of American Black Ducks were resting on the edge of the ice while the open water behind held a group of Lesser Scaup, Ruddy Ducks, and some gorgeous Northern Shovelers. Canada Geese and Mute Swans were present and a pair of sleeping Canvasback floated at the edge of the phragmites. 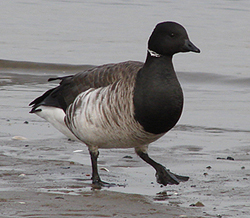 On the marsh side, Brant were abundant and busily feeding in the shallows. Nearby a large flock of about 100 Snow Geese had congregated on the waters edge. 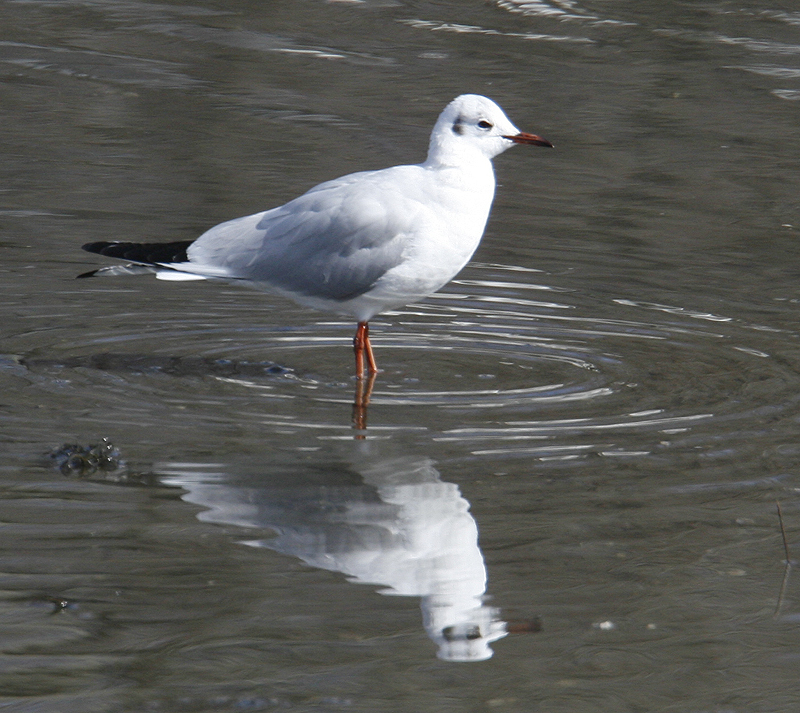 Herring, Great Black-backed, and Ring-billed Gulls rested and bathed in the pond. Out toward the middle of the pond were Pied-billed Grebe, a few Gadwall, Double-crested Cormorants, and several Green-winged Teal. Red-winged Blackbirds worked the thickets and reeds and out on the open water we found 30 Buffleheads and a lone drake American Wigeon. Heading back toward the parking lot, we spotted several American Tree Sparrows, American Robins, and a Yellow-rumped Warbler. We left Jamaica Bay for Jones Beach State Park in Wantaugh, New York. From the entrance road, we could see the Atlantic Ocean through windswept dunes and we scanned for ducks on the inlets finding mostly Brant. We reached the parking lot at West End I where a group of birders were searching the swales for longspurs. In a few minutes, Steve scoped a Lapland Longspur for all to see. 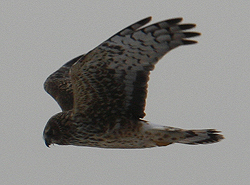 A Northern Harrier drifted over the dunes and a group of Snow Buntings was spotted feeding quietly on the ground. It wasn’t until they flew up and circled around that we counted no less than 50 birds. The wind began to pick up blowing scopes over reminding us that it was indeed winter so we decided to head out of New York toward Connecticut. As the sun was setting, we made a stop at the Edith Read Wildlife Refuge in Rye, New York behind the Playland amusement park. The feeders at the visitor’s center were quite active and we enjoyed great views of Fox, American Tree, Song, and White-throated Sparrow. We also saw several Downy Woodpeckers, a lone Red-bellied Woodpecker, White-breasted Nuthatch, Northern Cardinals, several Black-capped Chickadees, Red-winged Blackbirds, Mourning Doves, and a large flock of Common Grackles. Our first afternoon had seen us in glorious weather watching some great birds. Well satisfied, we set off toward our hotel to get ready for dinner. As we left the hotel to go to dinner, we noticed the bright, full moon and enjoyed the beginning of the lunar eclipse. We headed into town and enjoyed a superb evening meal before retiring ready for night wondering what the next day would bring. This morning after breakfast we set off to explore the lower Connecticut River. Our first stop was in Haddam across from the Goodspeed Opera House. As we entered the parking lot, Billie spotted a Red-tailed Hawk perched and as we got out the van the bird gave us excellent flight views as it circled above us. We walked toward the water and got far-off views of an immature Bald Eagle flying up river. In the river there were Common Mergansers, Common Loons, and distant Great Cormorants, while on the pilings of a dock there were several Ring-billed Gulls. Peter spotted a group of American Robins on the far bank, a treat for the Brits in the group. We moved on to another area further down the river and saw several soaring Turkey Vultures and some close Black-capped Chickadees. The highlight here was a group of Great Cormorants drifting lazily down river on a small ice flow. Our next spot overlooked a large area of the river and surrounding valley. No eagles present but we had superb views of a large flock of Ring-necked Ducks, a few Canvasback, and some smaller groups of Common Goldeneye. Moving on to the town of Essex, we checked the cove off Knott Road where two Killdeer flew over calling, and a pair of Hooded Mergansers gave a lovely show. Three Tree Swallows flew by, a very early record for this summer breeding species. Walking toward the town dock we had a good selection of birds coming to some garden feeders. Among these were Downy Woodpecker, White-breasted Nuthatch, House Finch, American Goldfinch, and a brief Dark-eyed Junco. We reached the dock and set up the scopes on a Bald Eagle nest where two gorgeous adults were in attendance. Further looks across the river here produced another seven immature eagles. A Red-shouldered Hawk flew into a tree on the west side of the river landing just below another juvenile eagle. After lunch, we drove to Hammonasset State Park in Madison, Connecticut. In the parking lot, there was a flock of about 50 Horned Larks and in the open fields we found three Killdeer. We drove further into the park as another two Tree Swallows crossed in front of the van. At Meig’s Point, we walked to the beach passing Song Sparrows and American Robins in the surrounding thickets. From the pavilion, we scoped distant Surf and White-winged Scoters. 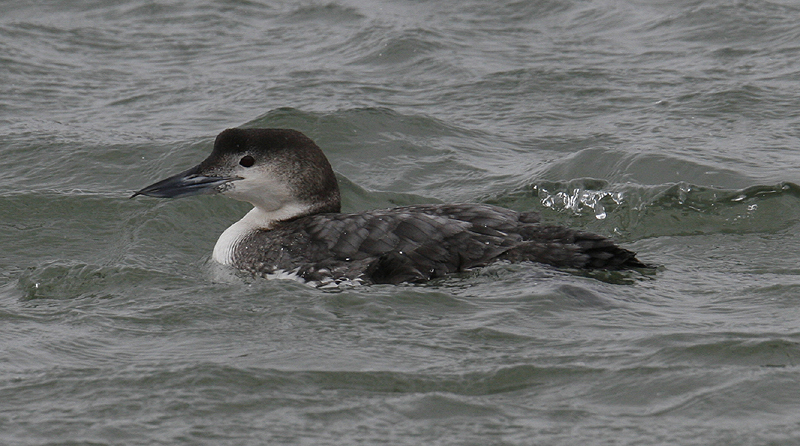 A further look at the sea produced several Common and a few Red-throated Loons and some Horned Grebes. From here, we drove further east to a beach area overlooking some vast sand flats. A short walk produced several Black-bellied Plover, Sanderlings, Dunlin, and a group of Ruddy Turnstones. We returned to the hotel and after dinner, we went owling in a private area of North Guilford. Our local guides found a fabulous Eastern Screech Owl for us in the yard. We moved to another area and heard a very close pair of Barred Owls. After breakfast we headed east to Rhode Island, the smallest state in the US. Our first stop was at Ninigret Pond National Wildlife Refuge in Charlestown. 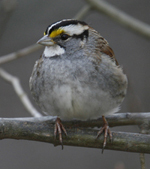 On the way into the park, we passed a small group of White-throated Sparrows feeding on the grass. We parked the van and walked to the trail head in light snow showers. The weather was icy cold but once we were near the pond we found the bushes provided quite a bit of shelter. We walked the trail and checked Ninigret Pond from several vantage points and got remote views of Common Goldeneye, Red-breasted Merganser, and Bufflehead. One close Common Loon gave us good views but the highlight was a stunning American Woodcock in the trail as we rounded a corner. We had excellent looks at this unexpected bird before it ran off into the bush. From here we went to Charlestown Breachway where the inlet from the sea provided us with stunning close looks at about twenty Common Loons. We studied their plumages which were starting to change from winter to the intricate black and white breeding pattern. At the mouth of the Breachway, we found a pair of Black Scoter as well as Common Eider, Red-breasted Mergansers and several Horned Grebes. More Common Loons appeared and a lone Red-throated Loon was scoped from the beach. We moved on to nearby Trustom Pond National Wildlife Refuge which we hoped would be more sheltered from the icy wind. The feeders beside the visitor center were active with Downy Woodpeckers, Tufted Titmouse, Black-capped Chickadees, White-breasted Nuthatch, and White-throated Sparrows feeding. From here we walked out to the pond where there was a big flock of Lesser Scaup mixed with Ruddy Duck, an American Coot and a couple of nice Redheads. We scoped a group of Hooded Mergansers and had good opportunities to study the subtle differences between a few Greater Scaup swimming among the many Lessers. Returning to the van, we stopped again at the feeders and this time added a pair of Dark-eyed Juncos to our list. We moved on to the Point Judith area for lunch in the fishing town of Galilee. After lunch, we checked the beach and the lighthouse area. Along the road, we spotted an American Kestrel on a telephone wire and turned back to get closer looks. We moved north to State Pier 5 which was finally out of the wind so we got out and looked out over the calm waters. We enjoyed close looks at Common Loons and Common Goldeneye, and watched a flock of Bonaparte’s Gulls feeding in flat water. There were several nice Red-throated Loons and a few distant Northern Gannets. Further up along the beach, we checked out several big flocks of Ring-billed and Herring Gulls and then moved on to Beavertail State Park in Jamestown. 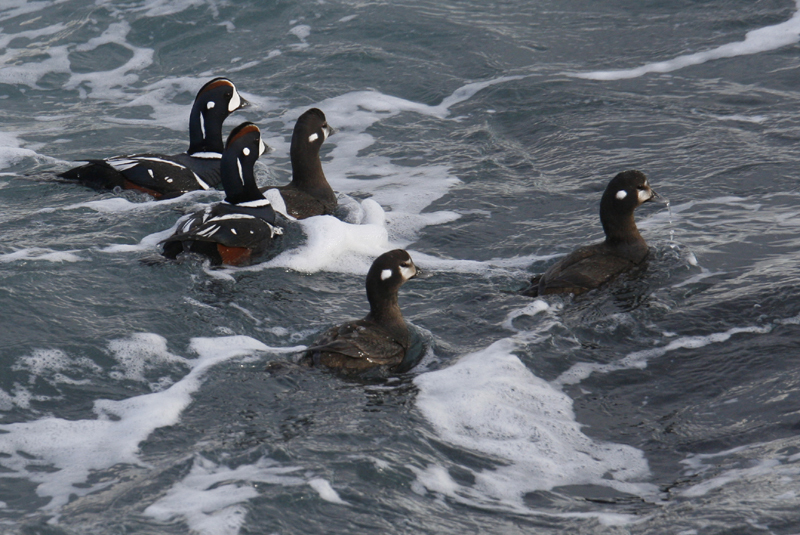 Driving slowly around the perimeter road, we spotted our prize of the day - a group of 10 exquisitely marked Harlequin Ducks. We parked and walked to the rocky edge and found about 50 of the fantastic little ducks, very close in small packs swimming and diving allowing the best ever views imaginable! The light was perfect and the adrenalin rush of seeing such beautiful birds made us forget all about the cold. Delighted with this we made our way to Newport and our harborside hotel. Today we enjoyed a hearty cooked breakfast as we knew today was predicted to be the coldest of the trip. This was confirmed by the short walk from the hotel door to our vehicle. It was icy cold!! We decided to do as much vehicle birding as we could so followed the coastal road stopping at any and every vantage point we could. 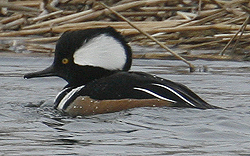 Brants were common on the rocky shore along with good numbers of Buffleheads and Red-breasted Mergansers. At Breton Point State Park, we spotted a flock of Snow Buntings and looks at the sea produced Common Loons, American Black Ducks, Red-breasted Mergansers, and Common Goldeneye. We parked and walked part of the famous Cliff Walk in Newport which allowed us to look below at Goldeneyes, Buffleheads and Black Ducks. A garden at one of the mansions held hundreds of Canada Geese and the bushes along the walkway produced several American Robins, Song Sparrows, Cardinals, and some nice Blue Jays. 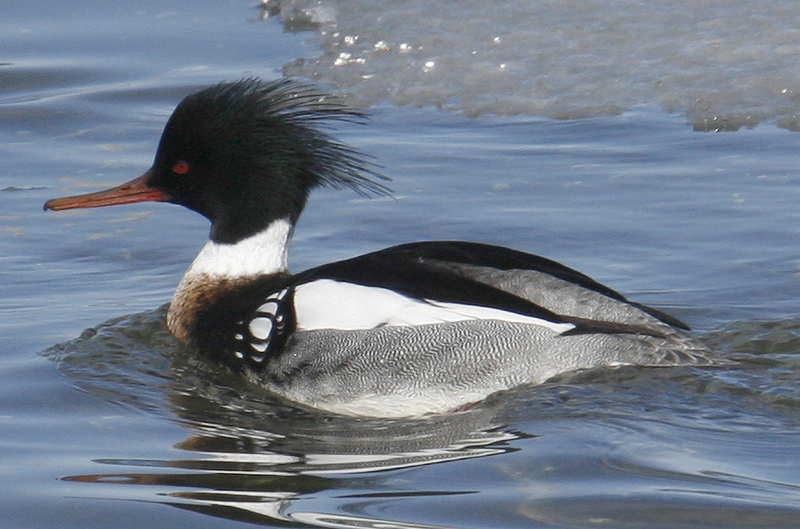 We continued to Easton’s pond which was half frozen but the open water contained a flock of Common Mergansers. From Third Beach, we scoped some close Surf Scoters and then moved on to Norman Bird Sanctuary. We checked the feeders there which contained the usual suspects and then walked down a trail to a small pond where Peter had seen Wood Duck. By the time we got there, the Wood Ducks were gone but we enjoyed great views of some Green-winged Teal. From here we checked a number of yard feeders as we made our way to Middletown for lunch. In one front yard close the road were four Wild Turkeys feeding on the debris under a feeder! After lunch, we went to Sachuest Point National Wildlife Refuge. The cold wind was relentless but we were hardy and walked the path through the field to the coast where we found a group of Greater Scaup, some nice Black Scoters, and several groups of stunning Harlequin Ducks. We walked the rocky coast scaring up Robins out of the brush and looking at Buffleheads, Common Goldeneye, Scoters and Eider in the sea. 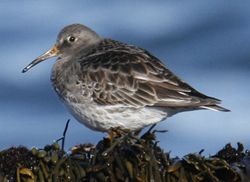 At the seaweed line on the edge of some rocks, we picked up a small flock of Purple Sandpipers feeding. It was a good day despite the cold and we made our way back to Newport for the night. This morning we said goodbye to Alice who was heading home to see an opera. We had breakfast and after assessing the weather decided that it was worth another try at Sachuest Point. This was good judgement as even though it was one of the coldest days, the sea was much calmer and chances to find sea duck much better. Walking along the coastal path we soon found groups of Bufflehead and several parties of Common Goldeneye. We scoped the birds offshore and Gina spotted a lone male Barrow’s Goldeneye among them. We set all the scopes up and trained our eyes on this group of birds until everyone had seen the Barrows and all of its salient features. Very pleased with our find we returned to the vehicle and headed for Cape Cod in eastern Massachusetts. Arriving in Falmouth, we checked out a pond beside town hall where we found a huge group of Lesser Scaup, several smart looking Hooded Mergansers, a Pied-billed Grebe, and some Green-winged Teal. In the thicket along the edge of the pond, we saw Carolina Wren, a lovely pair of Eastern Towhees, American Robin, Song Sparrows, and a few American Goldfinches. We moved to the other side of town and another pond which held three Ring-necked Ducks, a pair of Hooded Mergansers, and some Green-winged Teal. Since we were in the center of town, we decided it would be a good time to warm up with some soup and a hot drink so we made our way across the street to Liam Maguire’s, a well known Irish Pub. After lunch we drove to an area of beach where the usual Buffleheads were seen along with a group of Sanderlings and a Lesser Black-backed Gull. We moved on to Monomoy National Wildlife Refuge and explored the shore line which overlooked a huge bay that was almost completely iced over. The wind was bitter but in a fairly sheltered area we got great looks at several Long-tailed Ducks, Red-throated and Common Loon, and brief views of a Northern Harrier and a single White-winged Scoter. Our next stop was Chatham Fishing Pier. From the warmth of our vehicle we searched through the flocks of Ring-billed and Herring Gulls, and also got close views of Common Eider, Red-breasted Mergansers, and Brants. A group of Gray Seals frolicked on a sand bar our in the harbor and some Black-bellied Plover and some Dunlin were spotted in amongst the gulls. The highlight here however was to see stream after stream of Common Eider flying past and out to sea. After awhile, we began to count them and reached over 7,000 birds by the time we left the area. Quite a spectacle!! The sun was setting so we made our way back to our hotel for the evening. This morning after breakfast we drove to Provincetown at the tip of Cape Cod. Our first stop was Race Point, a sprawling windswept beach with excellent views of the Atlantic Ocean. 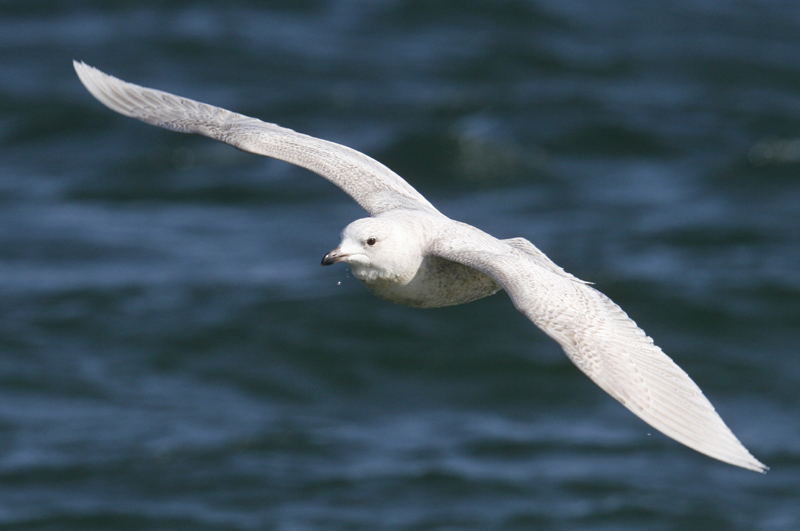 As we walked through the sand dune, we spotted our first Kumlien’s Gull flying along the beach – one of six Kumlien’s located during our sea watch. Close to shore were several Red-breasted Mergansers and a few Red-throated Loons. Further out, we could see large flocks of Razorbills moving in every direction. A few distant winter plumage Black Guillemots bounced in the waves and Northern Gannets could be seen way out over the sea. We moved on from here to Macmillan Pier in the sleepy village of Provincetown where we thought we would be protected from the wind. Among the fishing boats were close Common Eiders and more Red-breasted Mergansers but the real treat was a group of three Harbor Porpoise that swam into the harbor right in front of us. Some Long-tailed Ducks gave us very close views as they called and chased each other between the piers. From here, we moved down to Wellfleet Harbor and found it completely iced in. On our way out Billie spotted a juvenile Great Blue Heron hunkered down in the marsh. We moved further on to Wellfleet Bay Wildlife Sanctuary where we watched very active bird feeders from the warm comfort of a lovely new nature center building. At least a dozen Northern Cardinals gave us fabulously close views as did American Goldfinch, Red-winged Blackbirds, American Tree Sparrows, Song Sparrows, Blue Jays, Dark-eyed Juncos, House Finches, and two Red Squirrels. From here we checked Coast Guard Beach and found White-winged and Surf Scoter in the waters off the beach. With the wind strong from the north, we decided to check West Dennis Beach on the south shore of the Cape. The wind was still strong there but the waterways in the marsh produced Hooded Merganser, Brant, American Black Duck, and Canada Goose. 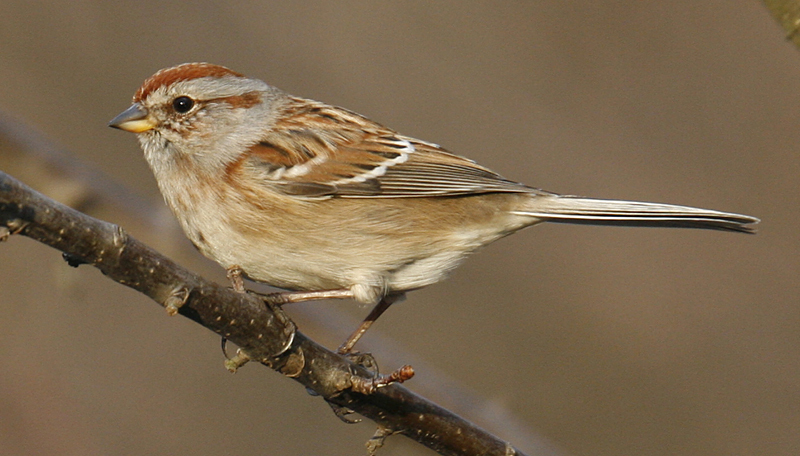 Steve searched the dunes for sparrows and found one Song Sparrow. We returned to our hotel and went out for a Mexican meal at a local restaurant. After breakfast today we set off to the northeast coast of Massachusetts above Boston. Our first stop was at the Jofrey Fish Pier in Gloucester where hundreds of gulls were milling around the fishing boats and factories. 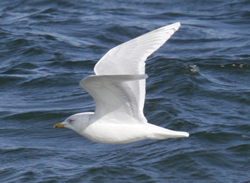 A quick scan through the masses of Herring Gulls produced two first year Iceland Gulls and a Black-headed Gull. A more thorough search revealed six Iceland Gulls and Gina found a nice first year Glaucous Gull which allowed us good comparisons of structure, bill and head shape. Moving on to an area overlooking a bay we set up our scopes on a nice male Surf Scoter. 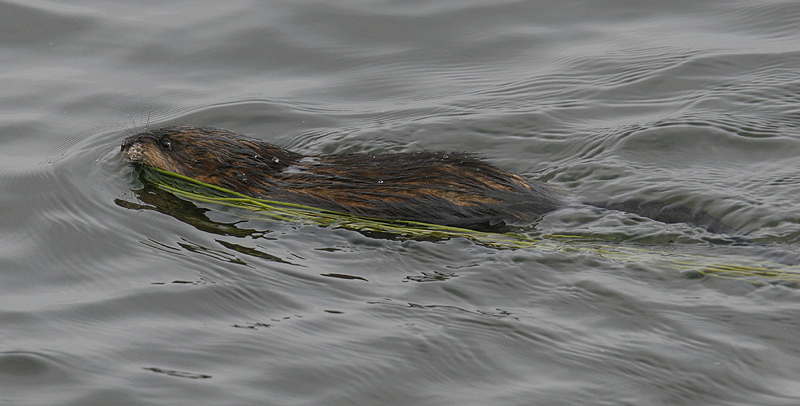 On the open water we found Common Eider, Common Goldeneye, Bufflehead, and a distant Eared Grebe. Happy with our finds and the way the day was going, we continued around the coastal road until we reached Eastern Point Wildlife Refuge, where we quickly located a couple of Gadwall among the Black Ducks. We walked out to a rocky overlook and scanned the sea. Soon, we found several breeding plumage Black Guillemots as well as some winter plumage birds, and White-winged Scoter, and Common Eider. The views of the birds from here were exceptional with the city of Boston in the distant background. We drove on via Atlantic Avenue through good section of rocky coastline. The day was sunny with blue skies but it still had a definite chill in the air. 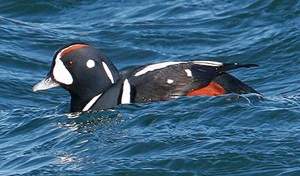 Out at sea were Red-throated and Common Loons, Common Goldeneye, Bufflehead, Common Eider, White-winged and Black Scoter. Steve motioned us to walk in his direction to see a superb male King Eider! We moved position so as to improve the light on this beautiful duck, and then enjoyed watching it dive and preen itself for several minutes. Nearby, a couple of Red-necked Grebes spent most of their time with their heads tucked in asleep, but with patience we were able to see them up and alert. We forgot about the cold for awhile as we marvelled at the great sightings we had today. We went for lunch in Rockport before setting off to our afternoon destination - Plum Island. As we reached the Plum Island area, we headed directly to Parker River National Wildlife Refuge hoping to keep our birding streak alive! We drove into the wildlife sanctuary and slowly cruised the road adjacent to a huge expanse of salt marsh. Northern Harriers appeared and showed well, as did our first Short-eared Owl perched on the ground near the entrance to the refuge. 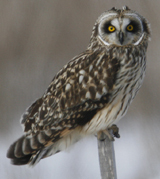 We eventually saw no less than six of these attractive owls quartering the marsh. At one point, we stopped to watch two Short-eareds attacking a female harrier. Driving back out, we stopped at a parking lot to scan the marsh. A large, white shape on the ground turned out to be a Snowy Owl! We were thrilled with this find and got distant views of it but the light conditions were not ideal so we took a short break at the Joppa Flats Visitors Center. Later in the afternoon, with the sun having dropped a little, we returned to the Refuge. We made a quick stop for a hovering Rough-legged Hawk before we got to the Snowy Owl spot. Once in the parking lot, we set up our scopes and trained them on the Snowy Owl. As the haze cleared, the views became better and better and we were able to see the bird’s eyes and facial markings. The Snowy shuffled around and stretched its wings and eventually gave us stunning flight views as it crossed the marsh and dropped into a ditch and out of sight. This bird put everyone on a high, after a fantastic day of birding, and celebrations ensued at our evening meal. After a leisurely breakfast, we took a short drive around to Parker River Refuge and tried looking for the Snowy Owl again. We scanned the marsh but the bird was not visible anywhere. 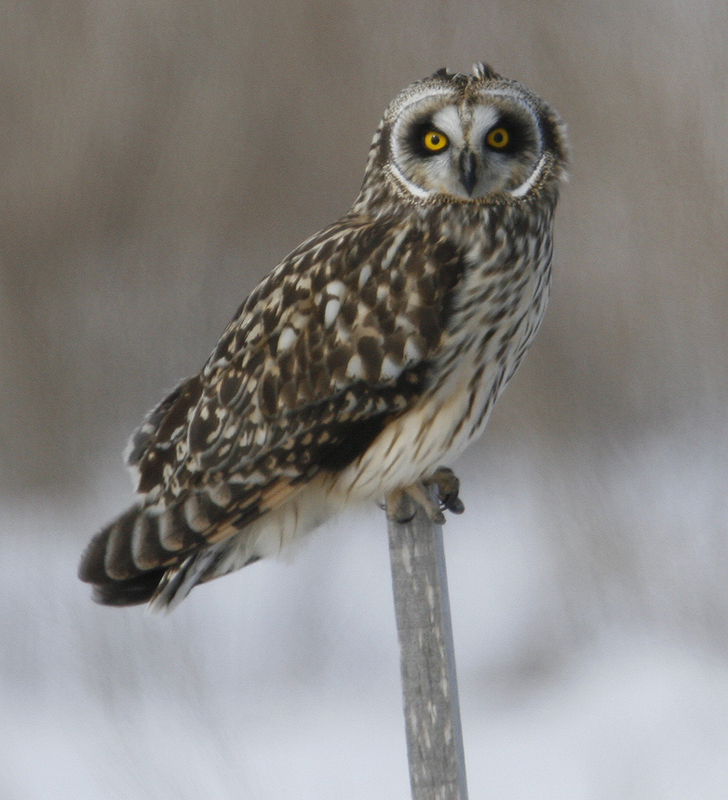 We did get good views of Short-eared Owl and Northern Harrier before leaving the refuge. From there, we went over to the Merrimack River and searched for wintering eagles. We soon located four immature birds – some perched in trees, others soaring above, and one bathing in the river. Common Mergansers were in the river as well and a number of Great Cormorants flew past. We tried another section of the river and found two adult Bald Eagles flying and perching in some large pines. As we watched one dive down to catch a fish, two other birds chased it and engaged in a mid air battle! It was an incredible wildlife show! Leaving the Merrimack, we took a quick look at Salisbury Beach State Reservation where our highlight was a Red Fox walking across the ice covered salt marsh. We watched the fox for several minutes as it waded into the water toward some ducks but never chased them. 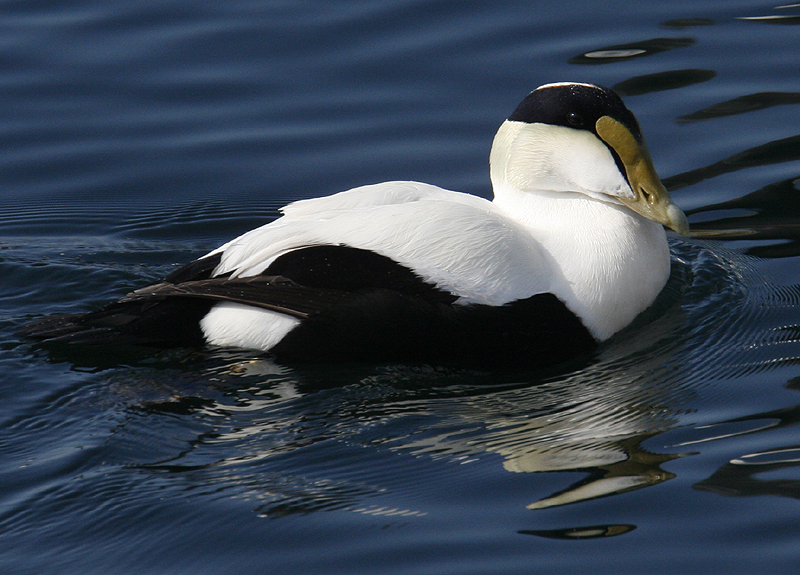 There were plenty of Common Eider in the bay and along with Common and Red-throated Loons, Common Goldeneye, and about twenty Gray Seals hauled out on a rocky island. In late morning, we left this wonderful area to head south toward Connecticut. We found a unique “Books and Food” café along the highway with feeders that produced juncos, sparrows, and cardinals. Further into central Connecticut, we reached an open area near the Durham. Steve explored the wet part of the meadow and flushed up one Common Snipe. We continued on to Chatfield Hollow State Park and walked the trailed hoping for woodland birds. Several called in the treetops but never came into view. On our walk out of the park, we encountered a small flock with chickadees and Tufted Titmouse and were able to get a good look at a Golden-crowned Kinglet. We headed back to our hotel and check in and then went right back out to explore Stewart McKinney Wildlife Refuge at dusk. We walked to the middle of an open field and waited for darkness to fall. It was notably quiet until we heard the unmistakeable “peent” of a close American Woodcock. The woodcock took flight from some high grass and ascended up in an ever widening spiral, its wings making a twittering sound. When it reached a certain high, it fell to the ground in a zigzag motion and landed 20 feet from where we were standing. As if this wasn’t spectacular enough, the bird called again several times and did another display flight, this time landing 5 feet from us! It was incredible to be so close to this fascinating bird as it continued to call for several more minutes. It flew again and landed in its original spot this time with followed by another woodcock. Both birds flew off together. What a sight! Thrilled at yet another wildlife spectacle, we made our way back to the hotel and an excellent farewell dinner! We said our goodbyes to Billie, Frank, Peter, and Steve. The time change made our early departure an hour earlier and we left before first light to get to the airport for our flights home. It was a fabulous trip with hardy birders and fantastic birds.